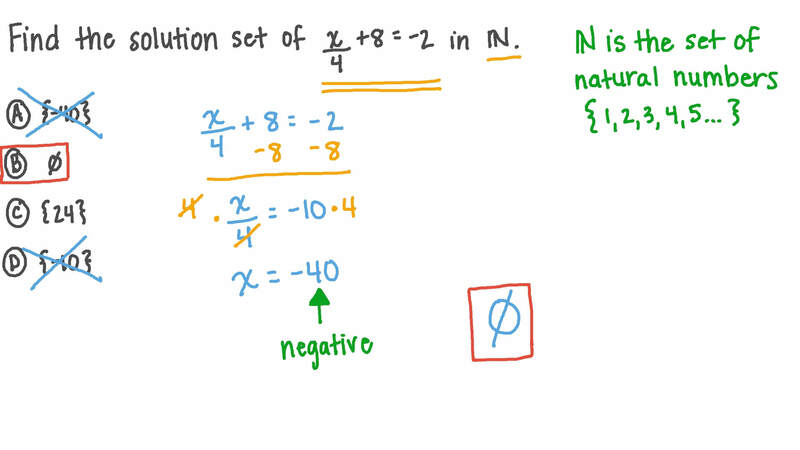 In this lesson, we will learn how to solve multiplication and division equations by finding the solution set of linear equations in the natural numbers and integers. Find the solution set of − 4 𝑥 = 3 6 in ℤ . Find the solution set of 𝑥 4 + 8 = − 2 in ℕ . Find the solution set of 𝑥 2 − 6 = − 3 in ℕ .
Nabil drives the same distance to work, Monday through Friday. Last week, he drove 30 miles over the weekend, for a total of 165 miles throughout the week. Solve for to determine the distance Nabil drives every day to work. Find the solution set of 𝑥 4 + 9 = − 8 in ℕ . Find the solution set of 9 𝑥 = − 3 6 in ℤ . Find the solution set of 7 𝑥 = 5 6 in ℤ . Find the solution set of 4 𝑥 = 3 6 in ℤ . Find the solution set of 8 𝑥 = − 2 4 in ℤ .